THIS POST COVERS: (I) "The Big Picture" as to WHY Paternity Fraud was perpetrated against Spencer C. Young; (II) "The Role of a Corrupt Kansas Judge" in this Fraud; (III) links to the "Federal Criminal Indictment Filed" against this judge and 49 others . . . so far; and (IV) "The Purpose of the BOGUS 3/11 Letter" (reproduced at the bottom of this post). The notoriously corrupt Kansas Judge Ron Svaty continues to perpetuate a preposterous paternity fraud in an effort to cover-up MorganStanleyGate, and he seems to be stepping up his efforts to save his own career, livelihood and liberty. Without question, Ron Svaty's outlandish criminal acts warrant his removal from public office and imprisonment in order to protect the public from this amoral pathological monster. 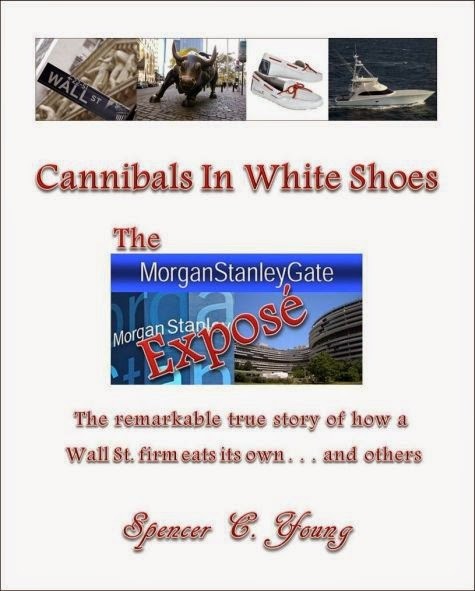 Specifically, his actions comprise a dastardly scheme to besmirch the character of former Wall Street Executive, Spencer C. Young, who has been exposing the ever-expanding criminal wrongdoings of Morgan Stanley, and by so doing, discredit the mounting damning allegations against this bank, and ultimately silence him through yet ANOTHER false arrest and unlawful incarceration, albeit this time based on a Paternity Fraud in Kansas ! Importantly, Mr. Young is pursuing extensive criminal and civil claims against an astonishing and ever-growing number of people and organizations who are now part of this massive scandal, which continues to grow in scope and magnitude with the increasingly outlandish efforts to cover it up. This AND MUCH MORE are detailed in his upcoming exposé, Cannibals In White Shoes. Mr. Young continues to receive a barrage of baseless, nonsensical and harassing letters that attempt to give Svaty's Paternity Fraud an appearance of legitimacy; however they are each as genuine as a . . . 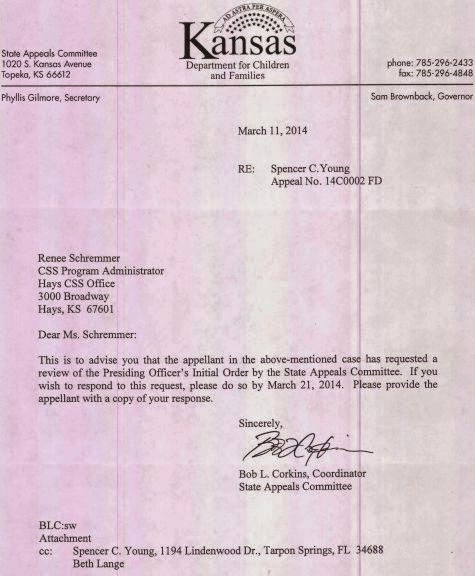 Reflected below is the entirely FRAUDULENT letter from Bob Corkins, who recently moved from his position as Chief Legal Counsel at the Kansas Dept of Children & Families to NOW Coordinator of the State Appeals Committee -- in other words this CORRUPT official is now presiding over the appeal of the PATERNITY FRAUD for which he was party to ! ! !. The underlying purpose of this BOGUS Letter of March 11, 2014 (see below) is give an appearance of legitimacy when it is only YET ANOTHER ELEMENT OF CRIMINAL COVER-UP, and this is why BOTH Renee Schremer AND Bob Corkins have been named as defendants in a Federal "Color of Law" Criminal Indictment. Having a CORRUPT CRIMINAL PUBLIC OFFICIAL (in this case, Bob Corkins) oversee the adjudication of a Paternity Fraud WHICH HE IS PARTY TO is . . .
Insulting to Anyone With a Brain !